Number One Nutrition Omega 3 Krill Oil is an omega 3 essential fatty acid supplement designed to improve mental, cardiovascular and musculoskeletal health. 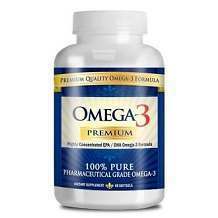 Unlike many other omega 3 supplements, the product does not contain fish or vegetable oil. Instead, it is derived from krill oil. Krill oil is found in krill; they are small crustaceans found in all the oceans of the world. The company claims that omega 3 supplements produced from krill oil are far more effective and beneficial than those produced from other sources. Krill oil has a keto-carotenoid substance called astaxanthin, phospholipid carrier and antioxidants. The presence of phospholipid carrier enhances the absorption of EPA and DHA. If you take the product regularly, your cardiovascular system will be healthier, and your cholesterol will go down to an ideal level. Eventually, the supplement will greatly reduce the risk of coronary artery disease, hypertension and stroke. It will also prevent mental disorders, cerebrovascular diseases and inflammatory disorders of digestive system, respiratory system, skin, muscles and joints. The product is made in the USA in a FDA approved facility. It comes in a plain white bottle with red labeling. Docosahexaenoic Acid – DHA diminishes the chances of various diseases that include Alzheimer’s disease, schizophrenia, dementia, stroke, mood disorders, Crohn’s disease, arthritis, cancer, hypertension, asthma and psoriasis. Docosahexaenoic acid is one of the most important structural components of the human body. It is needed for proper development and functioning of brain, sperm, testicles, retina, skin and cerebral cortex. Eicosapentaenoic Acid – Eicosapentaenoic acid mostly have the same benefits as docosahexaenoic acid. Together they build up the strength and immunity of the body. The product also contain omega 6 EFS such as gamma-linolenic acid and an omega 9 fatty acid called Oleic Acid. Gamma-linolenic acid is known to cure breast pain and eczema while Oleic acid is valuable for cardiovascular system. The manufacturer of the product has not mentioned anything about a daily dose on their website. However, as each serving is for 1000 mg, you can take one soft gel daily at mealtime. The price of the product is $22.99 for one bottle. Each bottle has 60 soft gels. The product is delivered with additional shipping cost. The product has 100% refund policy if satisfactory results are not obtained. However, there is nothing mentioned about the process of refunding. 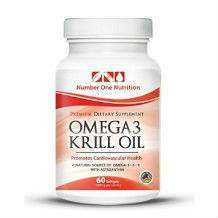 Number One Nutrition’s Omega 3 Krill Oil is a good product. However, as it is derived from krill, and not from fish oil, some beneficial ingredients are deficient or not present. Fish oil has been found to be more valuable for a healthier cardiovascular system than krill or vegetable oil. The manufacturer has not provided any information related to recommended dose, complete list of ingredients and refund policy.